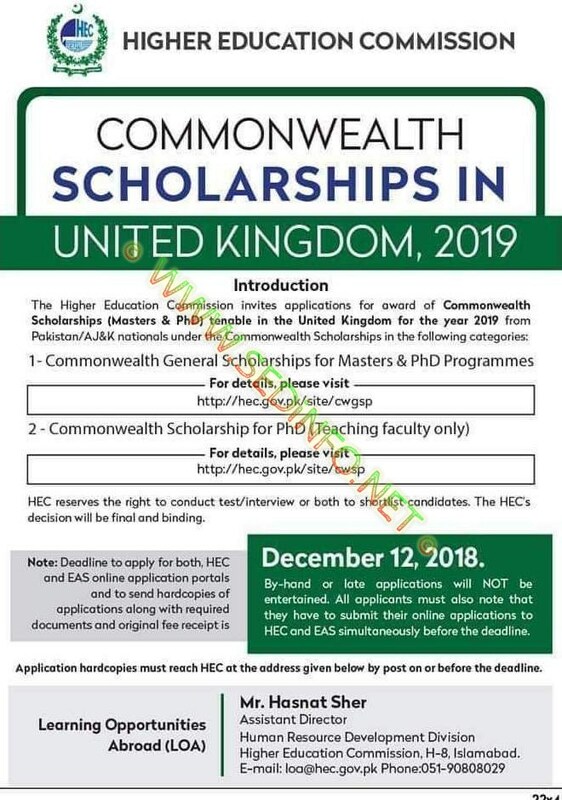 Here you can find latest update regarding HEC Commonwealth Master and PhD Scholarships 2019. HEC has announced Commonwealth Master and PhD scholarships for the year 2019. Higher Education Commission of Pakistan (HEC) offers many Master, Mphil and PhD scholarships to talented students of Pakistan and foreigners. For more details check HEC official link here. You can get latest updates regarding all HEC latest scholarships here on SEDiNFO.NET. To whom Scholarships is Offered? Be available to start your academic studies in the UK by the start of the UK academic year in September/October 2019. NOT be registered for a PhD, or an MPhil leading to a PhD, at a UK university before September/October 2019. NOT have commenced and be currently registered for a PhD, or an MPhil leading to a PhD, in your home country or elsewhere. Complete details of CSC programs, eligibility, Benefits and further classification of themes of study offered for 2019 Commonwealth scholarships is available at this link. Deadline to Apply: Deadline to apply for both, HEC and EAS online application portals and to send hard copies of applications along with required documents and original fee receipt is December 12, 2018.